Will Conway recently launched his own website. He has begun a new collection of short stories; Eat My Shorts. Each week a new story with illustration from a different artist will be posted at www.willconway.co.uk for your enjoyment. There are a number of great artists involved, some you may recognise from the pages of Lazy Gramophone. Keep your peepers peeled. This week's installment features a collaboration with none other than Danny Chidgey, who illustrated his first collection Tastes of Ink. 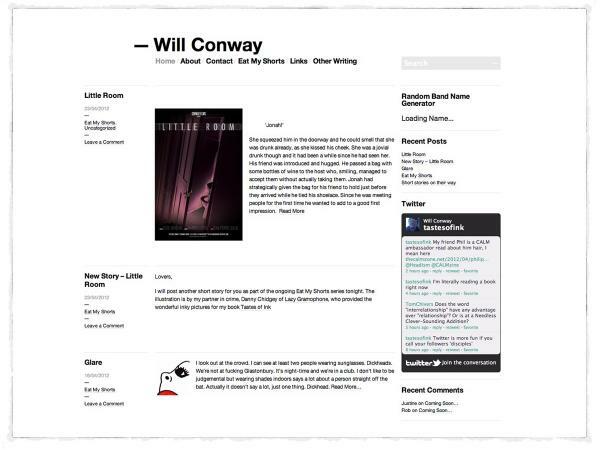 Tags for this post: will conway, blog, shorts, stories.